£350m per week. According to some, that's the amount of money the UK gives to the EU. Of course, it's not. We instead pay around £250m per week, due to the rebate that reduces the amount we pay - but that doesn't stop people saying and believing the first number. I've spent the last few weeks working with Full Fact to check some of the statistics in the EU referendum. From household income to immigration, jobs to red tape, we haven't yet found a claim that we can fully endorse - they're either completely wrong or at least misleading. These claims are coming from major politicians with huge followings. Prime Minister David Cameron; ex-London Mayor Boris Johnson; Labour Leave leader Alan Johnson; Ukip leader Nigel Farage. All of these people are getting away with twisting numbers to suit their own ends. Politicians have always done this - and they will always do so. But there's something wrong when campaigns can keep on repeating the same incorrect statistic - that the UK sends £350 million a week to the EU - without any consequences. Just to quickly explain why this figure is plainly wrong and misleading. The UK’s rebate, or discount, reduces what we would otherwise pay. 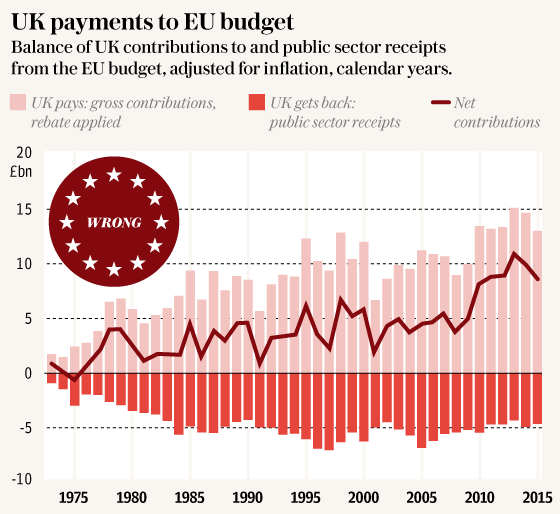 In 2015, we paid the EU £13 billion - working out at £250 million a week. But then there's the EU payments given to the government, which makes our net contribution around £8.5 billion, or £160 million a week. This is the UK's net contribution: still a big cost, but less than half the figure that many people now believe is true. This can be balanced against other ways in which the EU contributes to the UK: grants to British researchers, for example. The remain camp would then argue that it can also be weighed against advantages in business, trade and employment. Full Fact's guide to EU contributions goes into all of this in more detail. The number's been featured on the side of the Vote Leave bus for weeks. It's been repeated by numerous public figures and campaigners, plastered all over social media. My own friends and family have repeated the number at me when the subject arises. It's become a fact for people. But the problem is that it's not a fact. The UK Statistics Authority itself has said so. Sir Andrew Dilnot, chair of the UK Statistics Authority, said he was disappointed by the Brexit campaign's repetition of the claim, branding it "misleading and undermines trust in official statistics". And yet the leave campaign are still going around saying it without any consequences. Every time it's repeated, "£350m per week" gains traction. It gets spread around more people and slowly becomes reality. Just this week, the figure was repeated live on TV during a BBC EU debate, allowing thousands of people to be persuaded by a dodgy statistic. Where is the accountability for politicians and campaigns using poisonous statistics? They could influence the history of the United Kingdom - based on the misuse of numbers. But despite all this despair, the facts still matter. There isn’t a policy question in the world that can be settled by statistics alone but, in almost every case, understanding the statistical background is a tremendous help. So the facts do still matter. That's reassuring. We just have to figure out which facts matter - and hopefully before the EU referendum vote on 23 June. And for the future, there needs to be accountability for politicians and their use of statistics. They can't get away, as the Leave campaign might, by altering the history of a country through the misuse of data. Great article, Thanks for sharing this information and it's a worth read, keep updating your post.